The necessity of cleaning can be either a chore or a breeze, and much of it depends on using the right equipment for the job. The average American home has plenty of upholstery and spaces that dust mites and stubborn dirt can call home, not to mention the huge amounts of foreign matter that kids and pets bring home after a fun day out. The product engineers at Dyson have done a good job in creating a lean and mean cleaning machine – the Dyson V6 Absolute vacuum cleaner that can reach out into even the smallest gaps in sofas or car seats with ease, ensuring that residual dust is fully eliminated with minimal effort. Nothing takes the fun out of vacuum cleaning more than a stubborn, winding cord that yanks itself around furniture and fragile items. Thankfully, the Dyson V6 Absolute is fully portable and cord-free, packing an incredible amount of suction power into a small and elegant power unit. Weighing in at 2.3kg, the Absolute is light and ergonomically friendly, featuring a rounded vertical grip with a sizeable trigger that acts as the power button and ideal for people sporting both big and small hands. At first glance, looks can be deceiving. 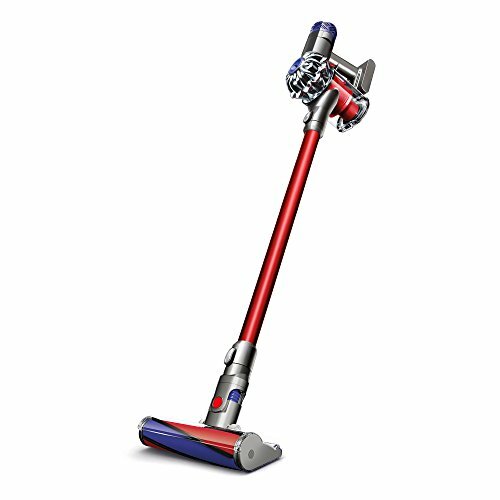 The blender-sized power unit contains a powerful motor that spins up to 110,000 RPM, ensuring that even the tiniest particles as small as 3 microns in diameter can be swiftly captured within the first pass, making the Dyson V6 Absolute one of the best cleaners that combines cleaning power with portability. The battery allows for 15 minutes of uninterrupted cleaning time and the Absolute also sports the option of plugged operation, ensuring reliable and robust power for the v6 Absolute at all times. The Dyson V6 Absolute comes with a range of accessories including a direct-drive head for carpets and floors, a dedicated hard floor roller head that allows hard-to-reach dirt lodged between the cracks of tiles or hardwood floors to be easily captured and smaller dusting brushes for small-scale cleaning. With such a powerful motor and accessories that are significantly improved over previous v6 models, hard-to-clean surfaces such as upholstery fabric can be easily and frequently vacuumed, making it hard for annoying dust mites to survive and cutting down on dust-related allergies in the long run! The v6 Absolute is ideal for tackling a wide range of cleaning situations in different places, and previously inaccessible spaces with no power supply such as cars or basements can now be cleaned with much ease and frequency. This is good news for many who own pets or spend long periods in their vehicles, as cleaning shedded hairs and eliminating microscopic bits and pieces that settle within hard-to-reach nooks and crannies are now much faster and convenient. Built-in, washable filters at the back of the v6 Absolute ensures that residual dust do not get expelled and reintroduced into clean rooms, giving a great peace of mind to all users. 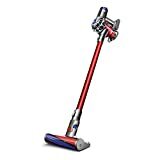 The Dyson V6 Absolute is built as a top-of-the-line cordless cleaner and comes priced as a premium product, easily costing up to $500 for its quality and build. The battery has to be charged before operation which can mean frustrating breaks between cleaning sessions, and with large houses it might take several charges to get cleaning done right. The Dyson V6 Absolute does not support steam-based cleaning which may be a downside for those looking for a good carpet cleaner or disinfecting machine, and its relatively small dustbin might need to be emptied frequently for major cleaning operations. What does the Dyson V6 Absolute vacuum cleaner comes packaged with? The Dyson v6 Absolute comes packaged with two heads (motorized and soft roller), four attachments, one docking station and the main unit itself. Optional cable operation is packaged with the docking station. Are the filters disposable or washable? The filters that come attached to the Dyson v6 Absolute are totally washable, cutting down on the need to procure costly disposable filters and driving the cost down! How big is the dustbin on the Dyson v6 Absolute? It comes with a 0.4 litre dustbin that is attached to the main power unit. It is generally advised to clean the bin by hand, as motor-assisted cleaners may damage the delicate fibres of the bin. 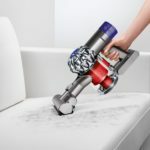 Dyson has created another winner with its V6 Absolute, which promises to put the fun back in cleaning anytime, anywhere. It’s small size and portability allows it to be used in many previously inaccessible spaces, and its powerful motor ensures that most dust and dirt are captured within the first pass. Its 15-minute cordless runtime ensures that most houses can be cleaned with a single charge, and the supplied accessories allows the V6 Absolute to punch far above its weight against other cleaners. However, its premium pricing, small bin and lack of steam support may put off some customers but ultimately it is really hard to find another vacuum cleaner that balances portability with power at the price range of the Dyson V6 Absolute.